The Milano is the inaugural Poker Chip of our casino clay poker chip line. 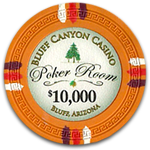 The casino clay poker chip line uses clays and other materials to arrive at a compression molded chip that will rival any casino chip. Clay has a distinctive texture that can not be replicated by composite materials. Our composites come close, but our casino clay is top of the line. Nothing sounds, plays, or feels like a clay poker chip. The latest trend in casino branding is to take a casino property and build them into beautiful palaces. Many of these palaces are named after the world’s most luxurious places. Casinos such as Paris, Venetian, Bellagio (Italian city), Rio, and Mandalay Bay come to mind as beautiful complex's that are named after the world’s most beautiful cities. 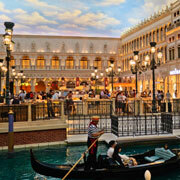 The Milano is our representation of this trend of palatial casino properties. 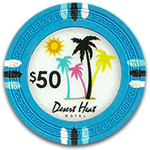 Our poker chip is designed to look regal and noble. The Milano chip prominently displays the denomination in the center of the chip. Scroll like images bookend the denomination. The Milano name is above the denomination and the denomination is spelled out along the bottom of the chip. The Milano employs a bold use of our edge spots known as the Double Trapezoid. This combination allows us to use two edge spot colors in differing amounts. We have a primary color in the "outer trapezoid" and a secondary accent color with the "inner trapezoid". The primary color is intended to blend or complement the base chip color. The inner spot color is intended to be more of a contrasting vibrant color to percolate the senses. Although the Milano is a fictitious casino, it will look and play like a real casino chip in your home game. The denominations are available in 25¢, 50¢, $1, $5, $10, $25, $50, $100, $500, $1000, $5000, $10,000. It doesn’t matter if you are hosting a large poker tournament with hundreds of thousands in tournament chip value or if you are playing a 25¢ – 50¢ limit game. This poker set will surely heighten your gaming experience. The mold that is employed for the Milano Poker Chip is known as the Stitch & Line. Upon close inspection, you will see a zigzag pattern around the poker chip, which has the appearance of stitching. There is a line that runs below the stitch marks. Together they create our mold: Stitch & Line. This mold is a unique molding design that does not have a close comparison to a historic mold of the past. The closest representation would be the zigzag mold that was used in early molding techniques. 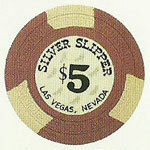 Casinos such as the Silver Slipper and the Crystal Bay Club used the Zig Zag mold in the early days of casino gaming. The Stitch & Line mold is attractive because it provides plenty of detailed indentions. The intricate details of the mold direct the focal point of the Milano chip to its edges and away from the inlay. With our beautiful casino clay line of poker chips we want the edge spots and mold marks to be the center of attention. 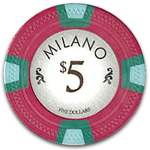 The primary influence for the Milano poker chip inlay is the Bellagio Casino chip. 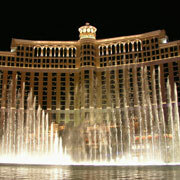 The Bellagio is the gold standard when you are ranking the world’s casinos that represent luxury. 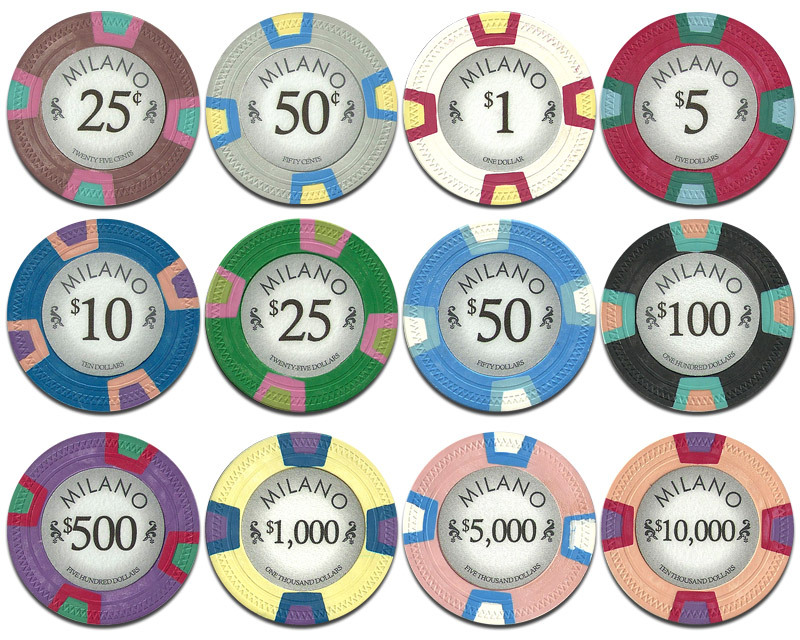 We wanted our poker chip to exude lavishness so we designed the Milano to have a similar layout as the Bellagio. 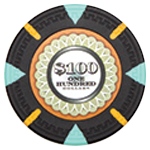 The centerpiece of the Bellagio and Milano poker chips are their denominations. Both chips use scroll like images to bookend and accentuate their denominations. 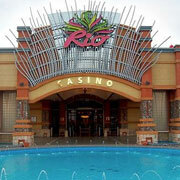 The names of each casino are prominently displayed in basic script letters. 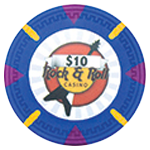 Both poker chips are very simple in design and they let their brands be the emphasis of the inlay. The Double Trapezoid is an edge spot that is very rarely used in today's casinos. We noticed a few historic strip casinos that used this edge spot many years ago. We thought the Double Trapezoid edge spot design was appealing and unique so we wanted to implement it in our own designs. This Circus Circus 1st edition poker chip has the Double Trapezoid layout for its edge design. It makes sense that a flamboyant casino like the Circus Circus would use a similar edge spot design to tantalize its casino patrons. The Circus Circus Casino also uses vivid colors on their poker chips to help build their "big top" circus theme. Our Milano poker chip also employs vivid colors to create an exciting poker chip layout. 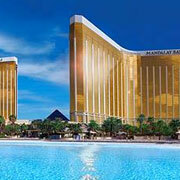 Two other historic casinos that utilized the double trapezoid were the Flamingo. 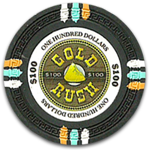 Both casinos used the double trapezoid slightly different but both have an excellent execution that makes their poker chips interesting and not just an average everyday poker chip. This mold is our own house design that was designed internally without outside influence. We intended the mold to be intricate to take advantage of our superior clay poker chip texture. There is an old Zig Zag mold that is somewhat similar to our stitch and line mold. 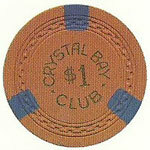 We see a similarity in this Crystal Bay casino chip that used the ZigZag mold. We like the ZigZag mold and the Stitch & Line mold because it brings attention to the edges to celebrate their interesting edge spots.